Many of you know by now that Riverbank Arts (www.riverbankarts.com) will be closing its doors at the end of the year, that is, the end of THIS COMING WEEK. The gallery was poignantly “eulogized” in the Bucks Country Herald (Nov. 17, 2011 issue) by local artist Alex Cohen. But somehow, despite that official au revoir, it remains very difficult to imagine Stockton, NJ, without this wonderful place. 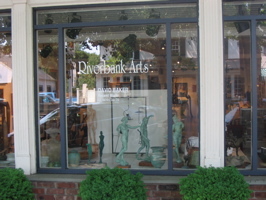 Since it opened in 1994, Riverbank Arts has been at the center of the area’s visual arts community, providing a supportive showcase to a wealth of local painters, printmakers, sculptors and others, some established, others up and coming. Meanwhile, co-owner Susan Roseman has continually demonstrated her generous community spirit through the lively Art Swaps at the Stockton Firehouse, support for the Stockton School’s annual Spaghetti and Art fundraiser, Arts at the Manor and loads of local networking for artists and art appreciators. Visit the gallery at 19 Bridge Street in Stockton, NJ through the end of 2011. And stay tuned at http://www.facebook.com/pages/Riverbank-Arts/114602168599322 and www.artienews.com. sad, sad news…..Thanx Susan and Peter for helping me along the way.